I promise: I’ll return to Swanky Franks someday and have a proper sit down diner experience and order these fries again. Promise. 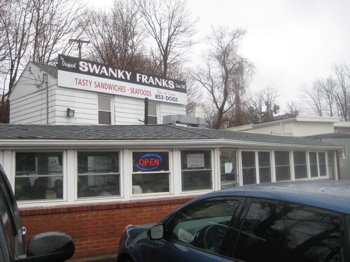 We stopped by Swanky Franks quickly between other CTMQ stops on a terrifically horrid day weather-wise. I ran in, ordered one order of fries to go (only one size here) and then waited, standing, until completion. Did I rush them? Make them nervous? I don’t know… But the tiny diner with the deathtrap parking lot right next to Route 1 across from an 1-95 exit ramp is quaint and harkens back to when this type of joint is all people had at which to eat. Like humans, French fries come in all shapes and sizes. The slender honey-brown twigs served at Swanky Franks in Norwalk are every bit as beautiful as the fat, creamy steak fries [elsewhere]. 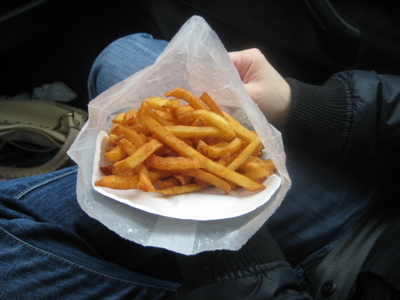 The French fries that complement the franks are hoisted from the hot cooking oil and tossed directly into a wax-paper-lined basket. They are cut thin and they are usually cooked quite dark; and while still hot from the fry kettle, these French fried potatoes are simply some of the tastiest ‘taters on earth. The little dining room was pretty crowded and everyone looked happy with their meals. They were also all staring at me like ordering “to-go” was blasphemy here. It very well may be, I don’t know. 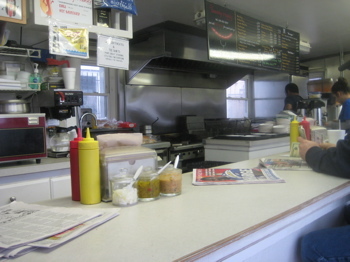 Swanky Franks has retained the old-school diner atmosphere and the workers were pleasant enough. I paid, grabbed my friends, ran through the monsoon to the car and eagerly anticipated our snack. 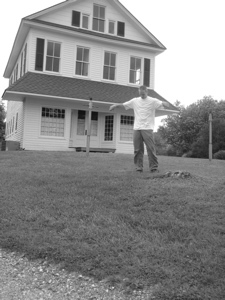 NO SALT! Yes, I know they simply forgot to sprinkle it on and I know it’s not fair to blast them for that. In fact, we (all three of us) ate all the fries – which speaks to their potato quality. I had McDonald’s fries once without salt and they were inedible mush. But really, without salt, they kinda sucked – as Hoang’s face here tells you.